WHYNOT – Maurice E., 95, of Milton, Queens County, passed away peacefully on Sunday, December 26th, 2010 in Queens General Hospital, Liverpool. Born in Milton on October 27th, 1915, he was a son of the late Harry and Martha (Ryer) Whynot. Maurice served as a lance corporal with the Royal Canadian Army Service Corps (Transport) during the Second World War supplying the front lines. He served in England, France Belgium, Germany, Italy and Holland. Upon his return, he worked for Bowater Mersey mill as a rigger foreman until his retirement. He was active in the Royal Canadian Legion, Mersey Branch #38, Liverpool having served as President for four years and also President of the Vets Club. On the 60th anniversary of the Liberation of Holland, he was able to make the trip along with his good friend Cameron Crowell and other comrades. Maurice was also a member of Trinity Anglican Church and served as sidesperson for a number of years. He was a Past Worshipful Master and Past District Grand Chaplain of Prince of Wales Lodge # 29, A.F.& A.M. , Milton and a member of Arbutus Chapter #30, Order of the Eastern Star, Milton., a member of Rossignol Chapter #6 and Affiliate member of Zetland Lodge # 9, A.F. & A.M. Liverpool. He was also a member of W.G. Young Lodge and EBN Cockran Lodge. Maurice was a past Noble Grand of Strathcona Lodge #90, I.O.O.F. Liverpool. In his earlier years he was very active with the legion helping with suppers and poppy campaign, generally helping out wherever he could. He was also Parade Marshall during July 1st activities. During Provincial Volunteer week, Maurice was nominated Volunteer of the Year 2006 and received his volunteer plaque in Halifax from then Premier Rodney MacDonald. Also, in his earlier years, Maurice enjoyed hunting and fishing trips with family and friends. He is survived by his sister Muriel (Frank) Morash, Moncton, NB; Sister in law June Whynot, Nepean, ON. And several nieces, nephews and cousins. 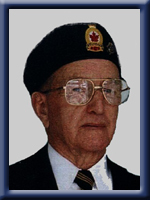 He was predeceased by his wife Kathleen (Long) in 1998 and sisters Belle MacLeod, Lily Richard, Kathleen Seaman. Infant brother Percy and brothers Raymond, Victor, Clarence “Hank”, Gerald and Herman. It is with greatest sorrow to hear of Maurices passing,Maurice and I joint Prince of Wales Lodge together in 1991 and he has been a great friend ever since.His generosity and help will be a great loss to everyone who knew him. He was always first to lend a hand on projects.He will be missed by many people but never forgotten. Maurice was one of the nicest men that ever walked the face of this earth and will be greatly missed. smile for everyone. Always ready for a chat.He will be greatly missed. May he rest in peace. Maurice and my father served together in WWII. While quiet about those times, they shared a special bond. Maurice ofterned appeared crusty on the outside, but those who knew him knew he was a softy in the inside, always generous and helpful. We will miss him, but hopefully take some of what he was with us always. I first met Maurice back in the early 1990s when researching the Whynot family. He had a great memory of “days gone by” and I enjoyed talking with him. He will be missed by his family and many friends. My sincere condolences to his family. sorry to about maurice. i was his secretary while he was president of the royal canadian legion in liverpool, i really enjoyed his company while i helped him at the legion. he was a very giid friend and my husband gary was also a friend and he served as sgt-at-arms when maurice was president of the legion. you are always in my heart. r.i.p. maurice. Was a neighbour of Maurice for many years and often played in the pond and hills behind his house. He always kept his property immaculate and let us kids know when we weren’t respectful. Looked after his mom for many years and was obviously a dutiful son. I still remember him coming across the street to help me and my dad when we were rebuilding the family home. we are very sad to hear of uncle maurices passing. our thoughts and prayers are with you all. Remembering all of Maurice`s family. God rest his soul after a long , wonderful life. Bruce recalls visits to the home in Milton next to the Whites during our time at Trinity between 1987 and 1996. I read in paper this morning, about Frank and Muriel’s death of her brother. Frank Morash was my husband’s Uncle.He spoke of him often. It has been 2 years and 11 months, since I lost Grant. It is very tough for me. I am O.K. I have learned, to take each day at a time, put one foot in front of the other and “shove”. Please accept my sincere sympathy on the lost of Muriel’s brother. Our deepest sympathy and prayers to all the family. I met Maurice at the mill. He was my supervisor for almost 2 years when I worked with the riggers in the mechanical. Maurice always took time to stop & talk . He knew & was a friend to many. Maurice will be missed. May God give comfort to the family during their time of loss. I am sorry to learn of the passing a my good friend, Maurice. I knew him well while living in Milton. We had many good times together as members of the Legion and a number of Masonic Organizations..A fine citizen; well done good and faithful servant.